It's a groundbreaking time for females in the military: The Marines continues to lift restrictions based on gender. The Marine Corps has recently announced the opening of seven military occupational specialty schools to female Marines as well as a new coed ground combat task force. The question now is how to put soldiers through the same training without making adjustments for the females. But as previous training courses have proven, besides the obvious physical differences, there are few obstacles these women can't handle as well as their male counterparts. Last fall, 85 female Marines successfully completed the challenging infantry training course at Camp Lejeune, N.C., alongside the men. The course lasted eight weeks and included drills such as simulating an attack on an enemy force in the wilderness. These drills were the same for the men and women. Now, the Marine Corps is expanding the number of roles to females, and with the opportunities comes an even more demanding training program. Despite the grueling physical expectations, females are still required to complete the same training course as the men. "Male and female, the task has got to be the same. Combat readiness will not be compromised. If we get this right, combat readiness will improve. And the second thing, we're not going to lower standards," Marine Lt. Col. Michael Samarov, who's part of the planning team, told NPR. "There's going to be a rigorous set of standards, and a Marine, male or female, is going to have to meet those standards, so this will exclude some proportion of the population," he added before pointing out that "there's going to be some men who can't meet these standards." 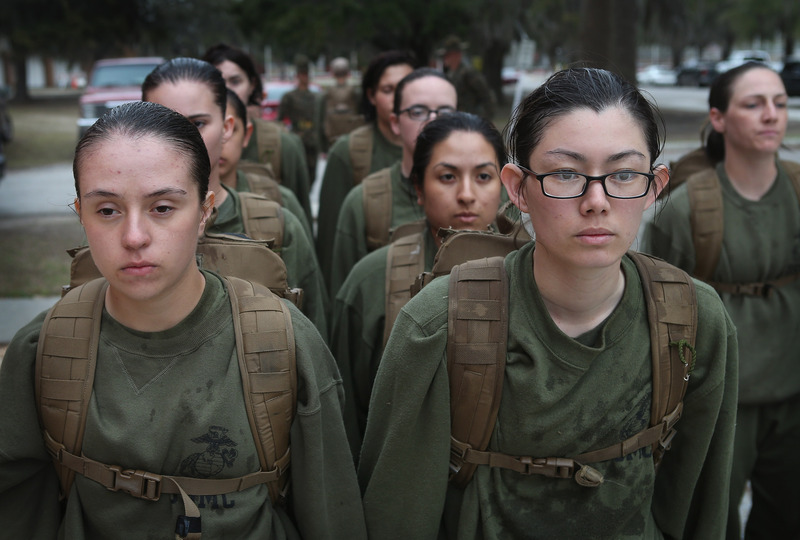 As we saw last fall at Camp Lejeune, there's little reason to worry about these female Marines. The new training program will include simulated combat exercises that will require the Marines to march while wearing 100-pound packs, crawl through obstacles, climb mountains, mount an attack utilizing tanks, and practice pulling a wounded soldier to safety. The course, which starts this summer and will last into next year, will take place in the Mojave Desert, on Pacific Coast beaches, and in the Sierra Nevada mountains. As tough as they may be — both mentally and physically — many females are at a disadvantage physiologically. In general, women are built smaller than men, and when a drill requires sheer strength, a 200-pound man will have an easier time than a 120-pound woman. One of the biggest challenges for women is upper body strength, which is required for many military jobs, like artillery, armor, and infantry. Katelyn Allison, from the University of Pittsburgh's Department of Sports Medicine and Nutrition, is taking part in a Marine Corps study along with other researchers to find a solution to this strength disparity. The answer, Allison explains, lies in physical training — training for the training, essentially. The study will also identify common injuries that afflict females more than males, such as sprained ankles and shin splints. Hopefully the research team will even discover an exercise that focuses on and expedites increasing upper body strength for women. And to underscore the importance of the study, and the intensive training program in general, Lt. Col. Samarov told NRP: "We owe it to the American people to make sure that somebody who's a Marine in a particular specialty can do the job, and we owe it to that Marine, to keep faith that young man or woman who has volunteered to serve their nation."